Intramedullary spinal cord abscesses are infrequently encountered in everyday neurosurgical practice. Hart reported the earliest documented spinal cord abscess in 1830. Since then, fewer than 100 cases have been reported in the medical literature. With modern antibiotics and neurosurgical techniques, even smaller numbers of these infections are expected to be encountered in the future. Since abscesses may occur anywhere along the spinal axis, anatomy varies with location involved. The most common location for an intramedullary abscess is the posterior thoracic spinal cord. Since the original publication of this article, several other case reports have been published that discuss intramedullary spinal cord abscesses. [1, 2, 3, 4] These case reports, while detailing several unusual presentations of patients with intramedullary spinal cord abscesses, add little to the core concepts promulgated in the original article. Patients with intramedullary spinal cord abscesses present with neurological findings related to the level of spinal cord involvement; MRI with gadolinium is still the procedure of choice for early diagnosis; and successful outcomes depend upon early diagnosis, aggressive surgical treatment, and appropriate antibiotic treatment following surgery. Even when these guidelines are followed, 70% of patients are left with neurological sequelae. The presumptive diagnosis of intramedullary abscess requires prompt definitive diagnosis. This of course necessitates demonstration of an infection with subsequent identification of that organism. Therefore, a laminectomy to diagnose and culture the organism is usually required. Abscess that compresses the spinal cord and its vasculature. Spinal cord abscesses arise in spinal cord parenchyma and can be solitary or multiple, contiguous or isolated, and chronic or acute, depending upon the organism and individual patient. As may be expected, solitary lesions are more common and most likely appear in the thoracic cord. Holocord abscesses have been reported in approximately 5 patients. Some authors divide these abscesses into primary and secondary, depending on the source of infection. Abscesses are considered primary when no other infection source can be found. Secondary abscesses arise from another infection site, either distant from or contiguous to the spinal cord, most commonly from the lung, spine, heart valves, and genitourinary system. Intramedullary spinal cord abscesses most commonly arise from a secondary source such as the cardiopulmonary system or from a source in close proximity to the cord such as the mediastinum. These classifications rarely affect treatment or patient outcome. Spinal cord abscesses occur more frequently in males than females with a peak incidence in the first and third decades of life. Too few cases have been reported to define any racial predilection. Patients with a history of intravenous drug abuse are at particularly high risk, as are other immunocompromised patients such as those with HIV, diabetes, or multiple organ failure. The most common organisms cultured from spinal cord abscesses include Staphylococcus and Streptococcus species, followed by gram-negative organisms. Mixed flora abscesses are also encountered. Other unusual organisms have been reported, including Actinomyces, Listeria, Proteus, Pseudomonas, Histoplasma capsulatum, and the tapeworm Sparganum. In 1899, Hoche demonstrated that abscesses may occur in areas of infarction, thus explaining the common incidence of septic spread to the lower half of the thoracic cord. 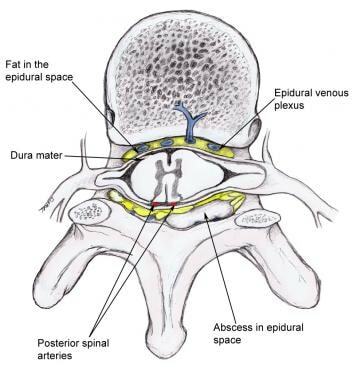 The Batson plexus (the confluence of epidural veins in the spinal canal) may contribute to the origin of an abscess by allowing organisms to lodge and thus develop in the spinal cord and its surrounding parenchyma. As with most neurological diseases, signs and symptoms depend upon the abscess location and duration. In an acute presentation, symptoms of infection (eg, fever, chills, back pain, malaise) are common. Neurological symptoms and signs include weakness, paresthesia, dysesthesia, bladder and bowel incontinence, and acute paraplegia. The neurological signs and symptoms are dependent upon the location in the spinal cord of the abscess with the most common location for an intramedullary abscess is the thoracic spinal cord. Clinical symptoms are similar to those of patients with epidural abscesses, but percussion tenderness is not noted. The outcome is generally good with appropriate use of antibiotics and surgical treatment. However, the abscess location determines the residual neurologic deficits. The patient's degree of sepsis ultimately establishes overall mortality. With the advent of modern antibiotics and lower surgical mortality, most abscesses are treated successfully. With steroids and more timely localization through MRI, neurologic deficits can be reduced. However, patients may be affected by devastating neurologic sequelae and may succumb to this disease. Overall mortality rates vary from 10-20%. Moreover, approximately 70% of patients demonstrate residual neurological sequelae following appropriate treatment. Importantly, a significant percentage of patients have recurrence of the abscess. Consequently, repeat MRIs are essential in patients' long-term and follow-up care. For excellent patient education resources, visit eMedicineHealth's Infections Center and Brain and Nervous System Center. Also, see eMedicineHealth's patient education articles Brain Infection and Antibiotics. Yuceer N, Senoglu M, Arda MN. Intramedullary spinal cord abscess in a 4-year old child. Acta Neurochir (Wien). 2004 Nov. 146(11):1273-4. [Medline]. Takebe N, Iwasaki K, Hashikata H, Toda H. Intramedullary spinal cord abscess and subsequent granuloma formation: a rare complication of vertebral osteomyelitis detected by diffusion-weighted magnetic resonance imaging. Neurosurg Focus. 2014 Aug. 37 (2):E12. [Medline]. Kamat AS, Thango NS, Husein MB. Proteus mirabilis abscess involving the entire neural axis. J Clin Neurosci. 2016 Mar 5. [Medline]. Arnáiz-García ME, González-Santos JM, López-Rodriguez J, Dalmau-Sorli MJ, Bueno-Codoñer M, Arévalo-Abascal A. Intramedullary cervical abscess in the setting of aortic valve endocarditis. Asian Cardiovasc Thorac Ann. 2015 Jan. 23 (1):64-6. [Medline]. Whitson WJ, Ball PA, Lollis SS, Balkman JD, Bauer DF. Postoperative Mycoplasma hominis infections after neurosurgical intervention. J Neurosurg Pediatr. 2014 Aug. 14 (2):212-8. [Medline]. McCaslin AF, Lall RR, Wong AP, Lall RR, Sugrue PA, Koski TR. Thoracic spinal cord intramedullary aspergillus invasion and abscess. J Clin Neurosci. 2015 Feb. 22 (2):404-6. [Medline]. Al Barbarawi M, Khriesat W, Qudsieh S, Qudsieh H, Loai AA. Management of intramedullary spinal cord abscess: experience with four cases, pathophysiology and outcomes. Eur Spine J. 2009 Jan 27. [Medline]. Akhaddar A, Boulahroud O, Boucetta M. Chronic spinal cord abscess in an elderly patient. Surg Infect (Larchmt). 2011 Aug. 12(4):333-4. [Medline]. Samkoff LM, Monajati A, Shapiro JL. Teaching NeuroImage: nocardial intramedullary spinal cord abscess. Neurology. 2008 Jul 15. 71(3):e5. [Medline]. Ebner FH, Roser F, Acioly MA, Schoeber W, Tatagiba M. Intramedullary lesions of the conus medullaris: differential diagnosis and surgical management. Neurosurg Rev. 2008 Sep 27. [Medline]. Hood B, Wolfe SQ, Trivedi RA, Rajadhyaksha C, Green B. Intramedullary abscess of the cervical spinal cord in an otherwise healthy man. World Neurosurg. 2011 Sep-Oct. 76(3-4):361.e15-9. [Medline]. Roh JE, Lee SY, Cha SH, Cho BS, Jeon MH, Kang MH. Sequential magnetic resonance imaging finding of intramedullary spinal cord abscess including diffusion weighted image: a case report. Korean J Radiol. 2011 Mar-Apr. 12(2):241-6. [Medline]. [Full Text]. Moritani T, Kim J, Capizzano AA, Kirby P, Kademian J, Sato Y. Pyogenic and non-pyogenic spinal infections: emphasis on diffusion-weighted imaging for the detection of abscesses and pus collections. Br J Radiol. 2014 Sep. 87 (1041):20140011. [Medline]. Kurisu K, Hida K, Yano S, Yamaguchi S, Motegi H, Kubota K, et al. [Case of a large intra and extra medullary abscess of the spinal cord due to dermal sinus]. No Shinkei Geka. 2008 Dec. 36(12):1127-32. [Medline]. Arzt PK. Abscess within the spinal cord: review of the literature and report of three cases. Arch Neurol Psychiatry. 1944. 51:533-543. Blacklock JB, Hood TW, Maxwell RE. Intramedullary cervical spinal cord abscess. Case report. J Neurosurg. 1982 Aug. 57(2):270-3. [Medline]. Ginsburg S, Gross E, Feiring EH. The neurological complications of tuberculous spondylitis. Pott's paraplegia. Arch Neurol. 1967 Mar. 16(3):265-76. [Medline]. Guzel N, Eras M, Guzel DK. A child with spinal intramedullary abscess. Childs Nerv Syst. 2003 Nov. 19(10-11):773-6. Kumar S, Gulati DR. Spinal abscesses. A report on 22 cases. Neurol India. 1978 Dec. 26(4):193-5. [Medline]. Marwah RK, Khosla VK, Agarwal KC. Intramedullary spinal cord abscess. Indian Pediatr. 1985 Jan. 22(1):71-4. [Medline]. Menezes AH, Graf CJ, Perret GE. Spinal cord abscess: a review. Surg Neurol. 1977 Dec. 8(6):461-7. [Medline]. Menezes AH, Van Gilder JC. Spinal cord abscess. Neurosurgery. 1966. 3323-3326. Schroeder KA, McKeever PE, Schaberg DR. Effect of dexamethasone on experimental brain abscess. J Neurosurg. 1987 Feb. 66(2):264-9. [Medline]. Tewari MK, Devi BI, Thakur RC. Intramedullary spinal cord abscess: a case report. Childs Nerv Syst. 1992 Aug. 8(5):290-1. [Medline]. Vora YA, Raad II, McCutcheon IE. Intramedullary abscess from group F Streptococcus. Surg Infect (Larchmt). 2004. 5(2):200-4. Wright RL. Intramedullary spinal cord abscess. Report of a case secondary to stab wound with good recovery following operation. J Neurosurg. 1965 Aug. 23(2):208-10. [Medline].